Established in 1990 and licensed by the Government of Egypt for the provision of Overseas & Local Recruitment. GHR Globo Human Resource is a professional recruitment agency specialized in the search for and the placement of qualified candidates in well-reputed organizations worldwide. GHR is a team of executive recruiters, researchers, and other supporting staff that work diligently to develop and maintain a long-lasting relationship with clients. Our reputation for quality and confidentiality has placed us among the pinnacle leaders in the recruitment industry. 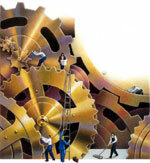 We take a great pride in recruiting for tomorrow's industry through quality oriented services. In GHR , we adopt the latest technique in screening, interviewing, selecting and processing the required candidates. As our background has awarded us the "KNOW-HOW" in recruiting medical and pharmaceutical staff, we uniquely provide professional recruits of other categories, i.e. Engineering, Accounting, Banking, IT, Consultancy, Sales & Marketing, Administrative, and other various activities. We always endeavor to prove that the HR industry is not only the key to reach the targeted SUCCESS, but also the main tool to retain SUCCESS. In GHR , we are committed to support our business partners / employers reaching and retaining their fruitful SUCCESS!. GHR , The Strength To Track….The Strength To Process….